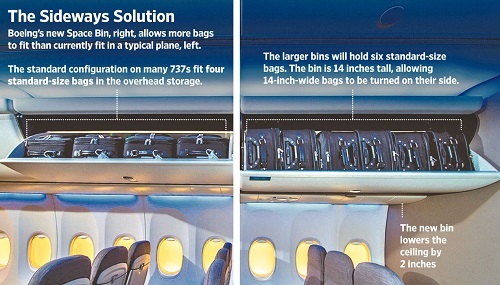 Boeing’s new Space Bin increases the number of bags a typical plane can carry by nearly 50%, reports The Wall Street Journal (Oct.15, 2015). A single-aisle Boeing 737-900 with 181 seats has room for 57 more bags, or a total of 174 rollaboard bags. That’s enough to accommodate a planeload of passengers with room for their coats. The space bins are big enough so you can actually stack two bags on top of each other or push two in sideways together. Alaska Airlines took delivery of the first Space Bin 737 on Friday and will put it into service this week. The new design can be retrofitted into most 737s, the most common plane in airline fleets, and it doesn’t add any weight to the airplane. Alaska has decided to retrofit its 737s and install big bins on new planes. Passenger surveys show the lack of overhead space is one of the biggest gripes about airline travel today. Boarding a plane has dramatically changed because of the carry-on crunch. Gate agents wrest bags from passengers in late boarding groups to tag them for checking. Some airlines have baggage tag printers at gates for all the bags that don’t fit in overhead bins. And flights get delayed when too many passengers can’t find room for their bags.